At this step, you can assign, edit and copy the flow properties for the model. You can assign properties while viewing either by Layer, Row, or Column. For each parameter group, you can choose to render by Zones or by a selected attribute. Based on your selection, the color rendering in the views will change. Use the same tools as described in the previous step to manipulate the views. At the bottom of the display, you will see in the status bar the position of your mouse cursor in the current view (XY) grid position (Layer, Row, Column), and the Zone ID or attribute value for the selected cell. When you use either the Assign/Polygon or Assign/Entire Layer option, the property zone will be assigned to the numerical grid and a corresponding conceptual property zone representation will be created; this is useful when you re-run the Conceptual to Numerical Conversion option for the current (or new) numerical grid. 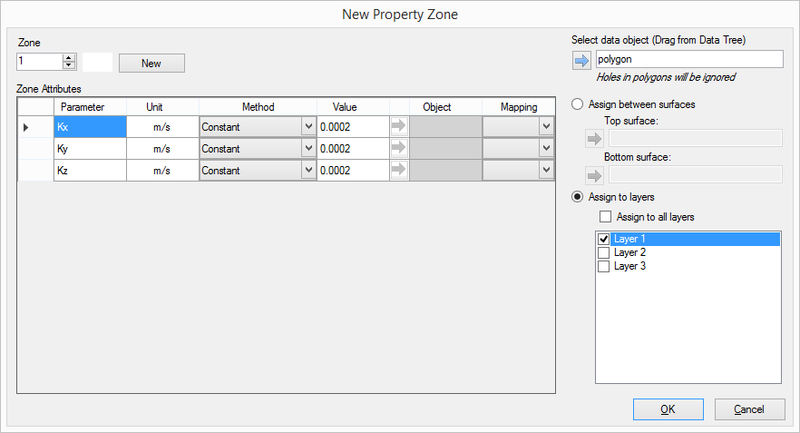 However, when you use the Assign/Single or Assign/Polyline options, no conceptual property zone is created; please be aware of this limitation should you choose to create a new numerical model from the conceptual model; the property values in this new model run may need to be adjusted. After you have done the desired cell selections, right click with the mouse to close the shape and select "Finish". The New Property Zone window will appear as shown below. Or, click the [New] button to create a new property zone. After doing this, a new zone number will be incremented. 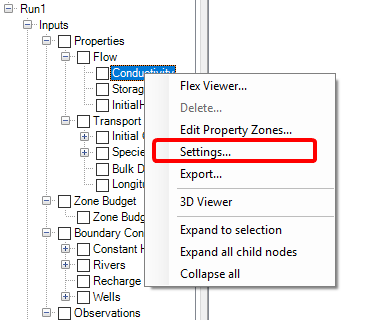 Next, select in which layers the new property zone should be generated, by default, your current layer will be selected, however you can include other layers or select all layers. Lastly, define the "Zone Attributes" for this new property zone in the main grid. 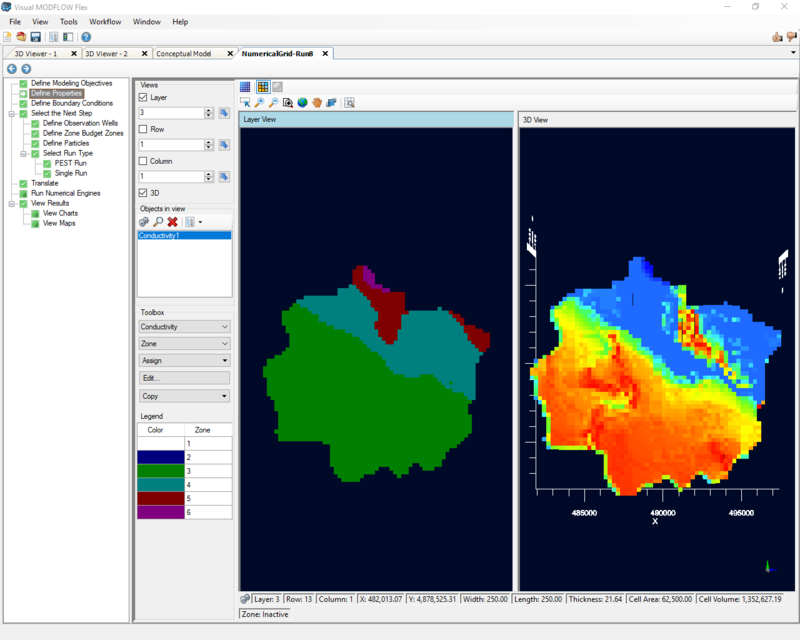 There are several "Methods" for defining the attributes, and these include Constant Value and Use Surface (Use 3DGridded Data and Use Shape Data are not applicable for this scenario). The Constant Value method is selected by default for each parameter in the data input grid and allows you to specify a spatially constant value for the parameter. Replace the default value with a new value. •Click the button to insert this data object into the Object field. Once you are finished, click OK and the new property zone will be created. (note, when you view the Database values for this new property zone, it will show "Distributed Values" since it contains a range of values for this zone, not just a single value). You may want to define initial concentrations from a .UCN file from a previous transport run. In order to use this option, you must need to import the .UCN file to the project, as a "3D Gridded Data" set. Follow these steps in the section "Import 3D Gridded Data". Once the file is imported, you select this object when defining the properties. •Click the [New] button to create a new zone. •Select "Use 3D Gridded Data" as the method from the combo box. •By default, Concentration should be selected in the "Mapping" column (you may need to re-select this from the combo box). •Once you are finished, click OK and the new property zone will be created. 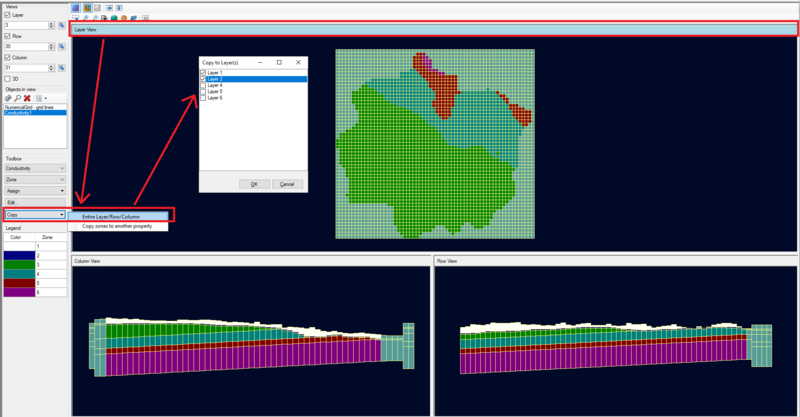 •You can view the Initial Concentration rendering for the full 3D grid, by changing the rendering type from "Zone" to "Initial Concentration"
Also available is the Script tab. If preferred you can make your edits by using the Script option. On this tab you will find the script for any edits you make on the Edit Cells tab allowing you to learn the script language. You can then use the script to "replay" the same edits again. Select the Copy button to copy property values from the current Layer, Row, or Column based on the active view (i.e. the active view is highlighted in blue) to other layer(s), row(s), or column(s). Note that you can click in a view to make it the active view. Also note that the currently active layer, row, or column will be filtered from the list. Each group of flow properties exists as a separate item in the model tree, as shown below. Right click on each node, and select Settings. This will allow you to modify the appearance of each group of flow properties. In addition, each property group can be added to a stand-alone 3D view; to do this, right click and select 3D-Viewer. Any of the model properties can be exported to shapefile; see Export for more details.